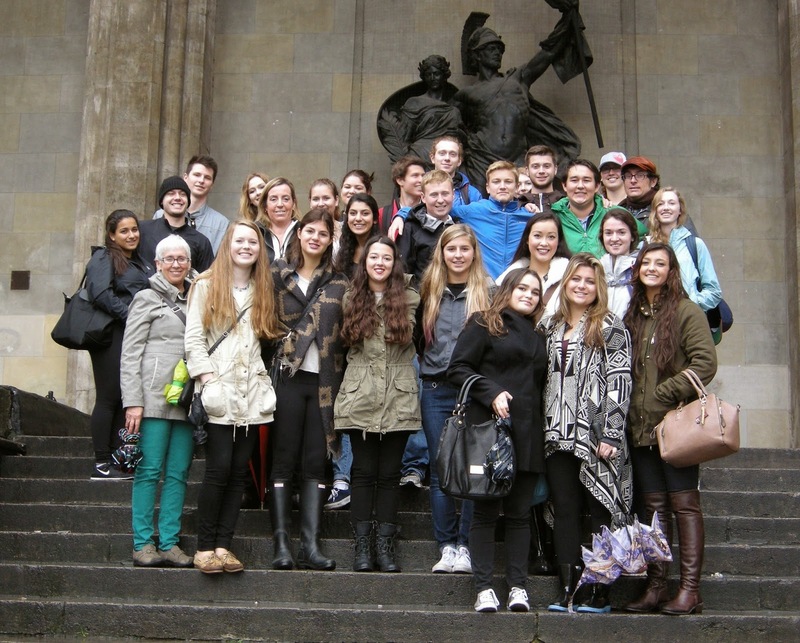 From October 16 to October 19, Bob and I went on a school excursion to Munich, Germany, along with 25 students and two other staff members. This was the second weekend in a row where students had the opportunity to experience a trip that would enlighten them on the events before and during WWII. 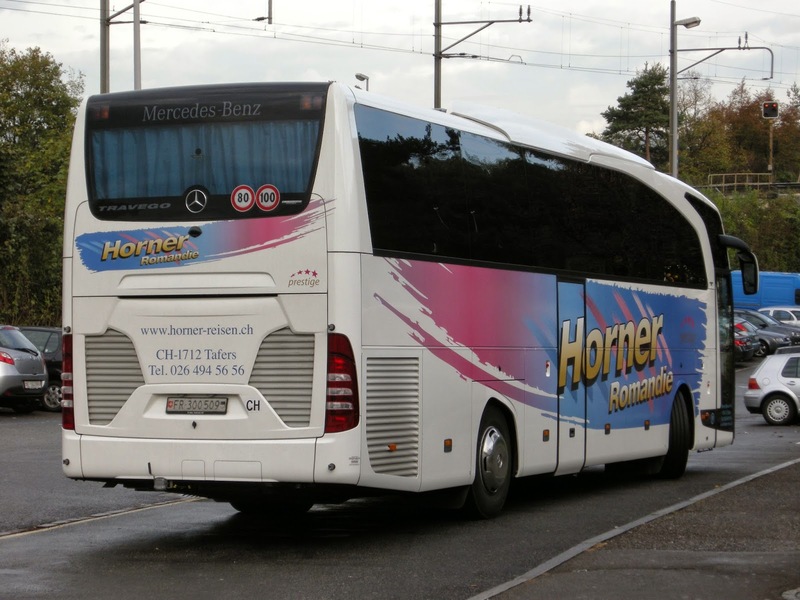 We traveled to Munich on Tony's brand new bus. Tony has been driving Neuchâtel students for about 40 years, and, I must say his bus was very comfortable. Our journey was such that we had breakfast in Switzerland, lunch in Austria and dinner in Germany. 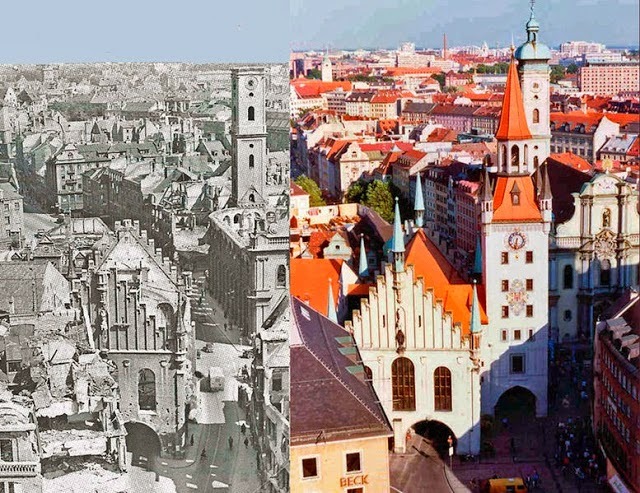 This is an image depicting Munich immediately after the war and after rebuilding. 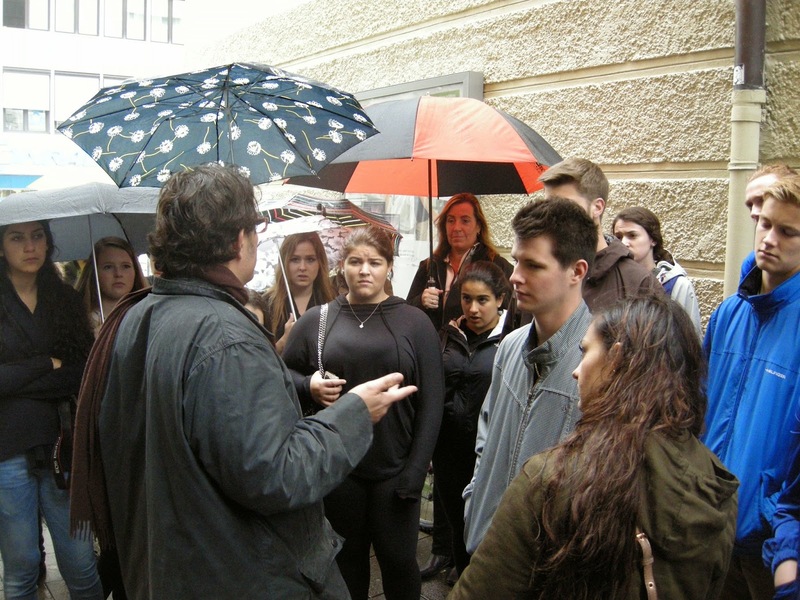 Upon arrival, Dan led the group on a brief orientation tour of the city. Munich, we discovered, had been very badly bombed during the war, but had since been rebuilt according to the original plan. As much as possible, the buildings have been erected to replicate those they replaced. This is not to say that the city does not fully acknowledge its Nazi past - quite the opposite actually, as we were frequently reminded during our walks. In the late afternoon, staff and students separated until dinner to explore the city on our own. 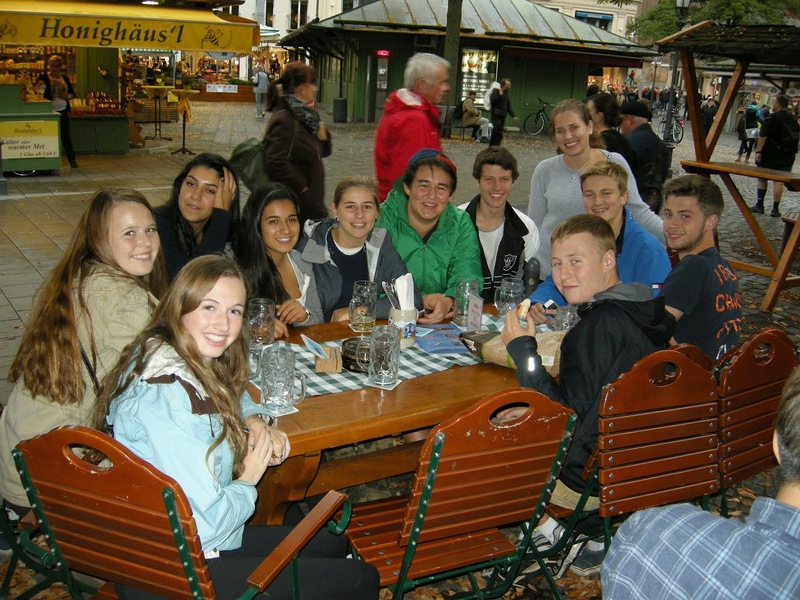 We all enjoyed the atmosphere at the Viktualienmarkt (a daily market) and ended up stopping for drinks there. The other main gathering place was Marienplatz in the centre of town, the site of a large part of our tour the next day. 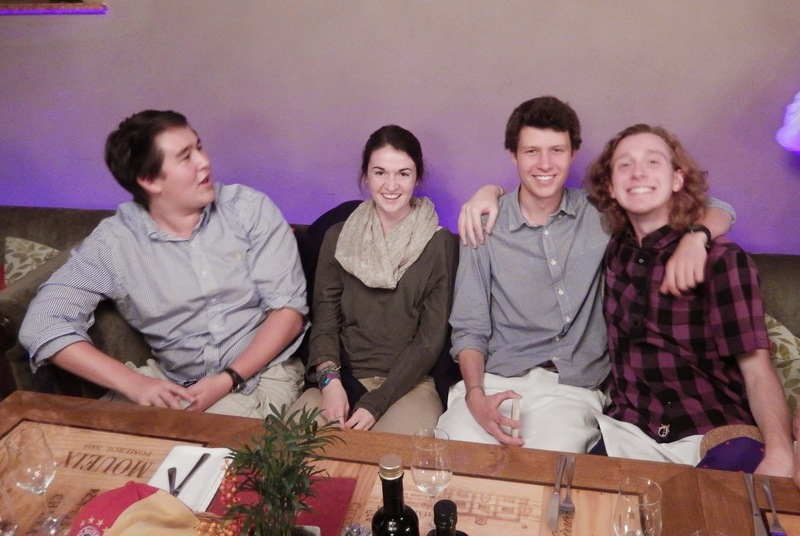 Dinner was nearby at a large Bavarian restaurant, with very large servings of Bavarian fare. On the Friday morning, we met our local guide, Robert Johnson, an American expat and historian who now lives in the Munich area. 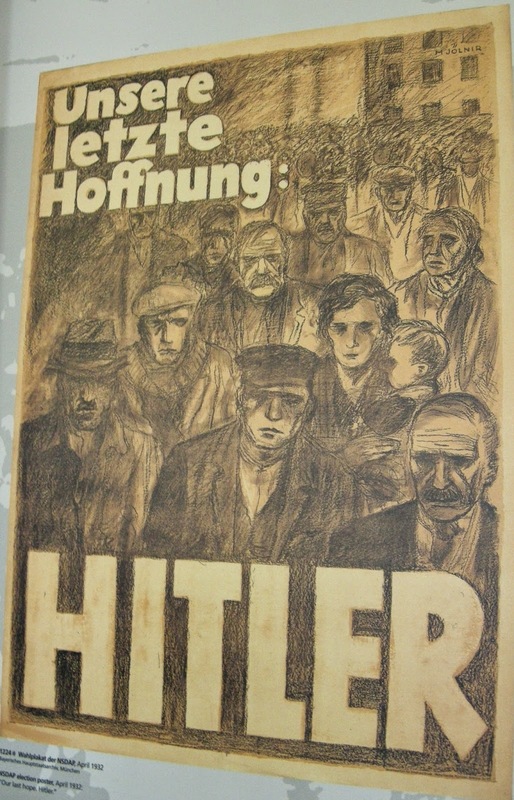 Robert had visited the school on the previous Tuesday to give a lecture about "the perfect storm" of political events that allowed for Hitler's rise to power. He had lived in Munich from 1913 to 1924 when he was imprisoned, except for the years when he was serving in WWI. Robert took us for a walk to places where Hitler spoke, where he joined the German Worker's Party (which would eventually become the Nazi Party), and where he was arrested. There are no monuments to the man, by the way. 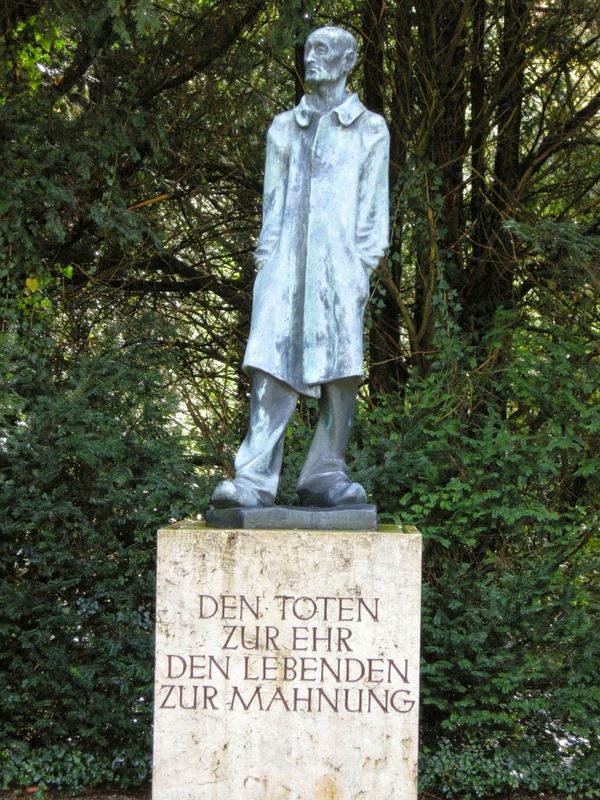 The Germans have no interest in honouring his memory in any way - in fact he was banned from Munich in the late 1920s. Robert tells us about Hitler's great speaking skills, and how he used them to ingratiate himself with the German Worker's Party. Note how attentive the students are to his every word. 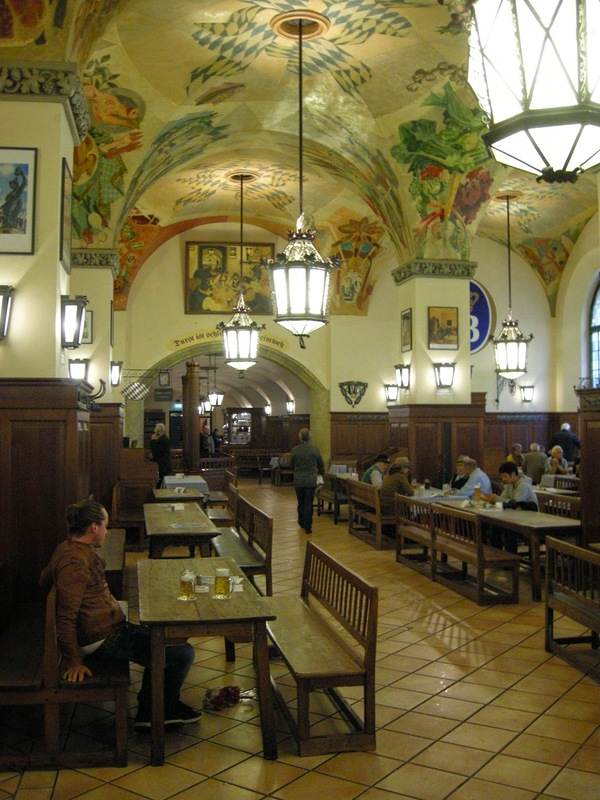 Hofbrauhaus: the city's most famous beer hall. Hitler spoke here. We were all enthralled by Robert's knowledge of Hitler and his time in Munich, but by the end of our walk, we sought out some pleasant distractions. 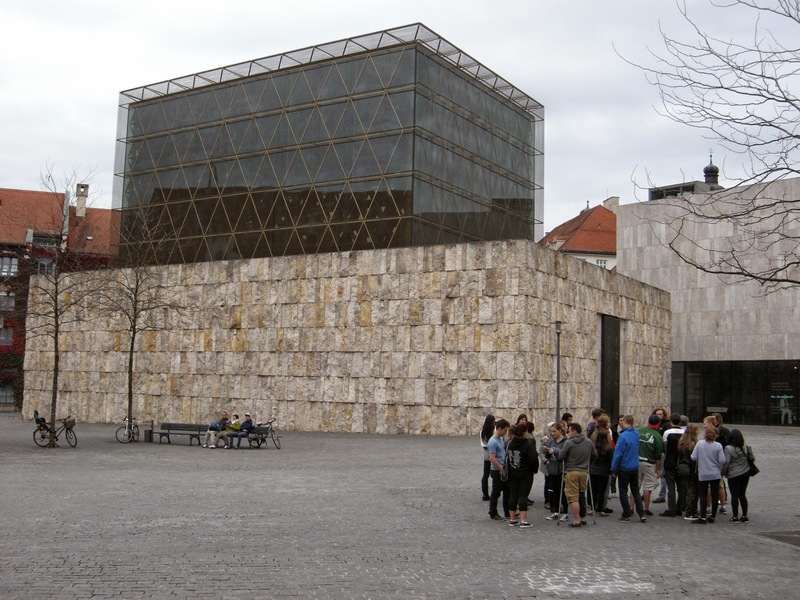 Bob and I chose to visit the Alte Pinakothek, a gallery dedicated to artists from the 14th to the 18th centuries. 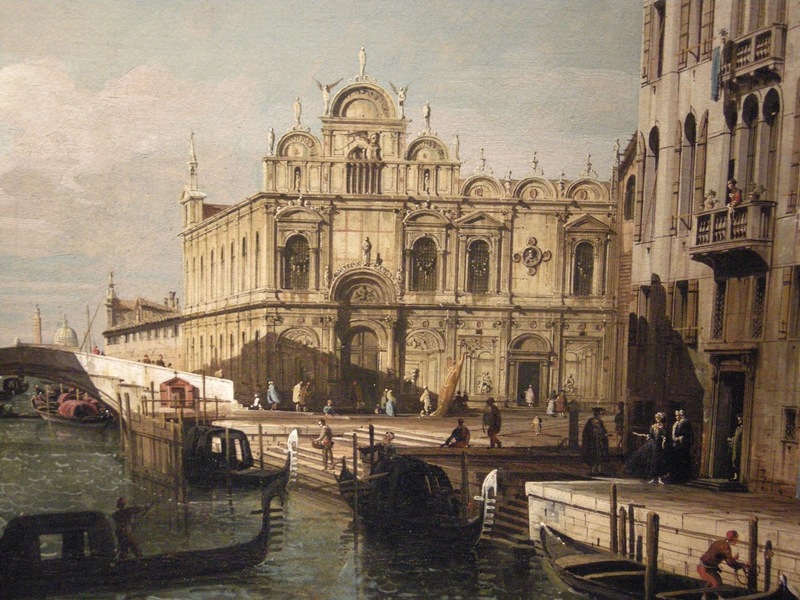 There was a special exhibition of the works of Canaletto, whose "vedutes" (cityscapes) we had admired in the past. He is best known for his depictions of Venice. 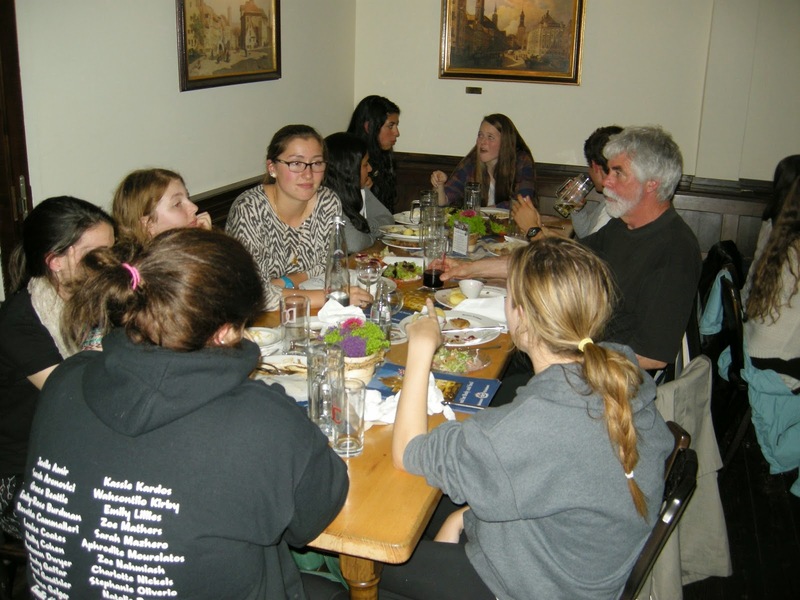 For dinner that evening, the students were on their own, so Jen, Dan, Bob and I found an out-of-the-way Italian spot, Vino & Cafe. The menu was written on a blackboard in the window, and nowhere else. There were only four or five options for dinner - all delicious, by the way. When we paid the bill - cash only, we discovered that the waiter had to go outside to consult the blackboard to determine the prices. Funny. Early Sunday morning, Robert met our group at our hotel where we all boarded Tony's bus and headed to Dachau, some 45 minutes away. We spent nearly four hours at Dachau, where under Robert's tutelage we learned a great deal about the horrors that took place there. 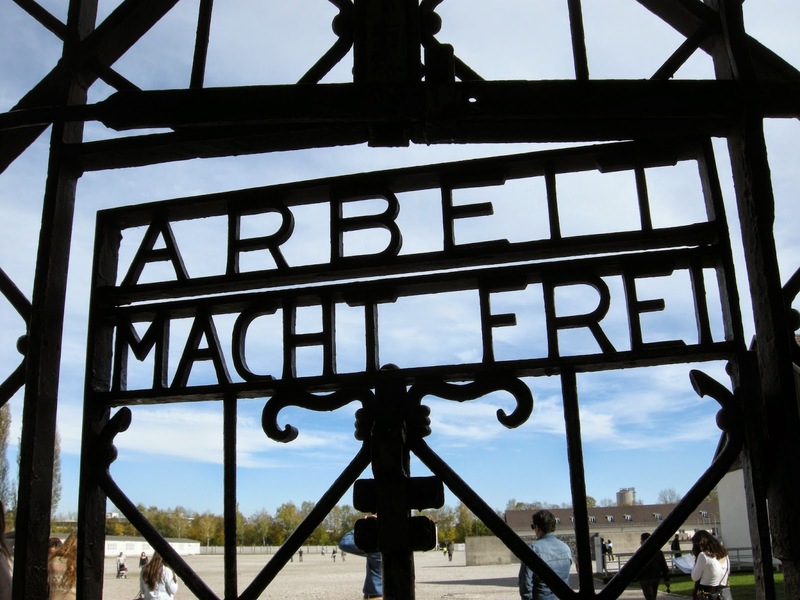 Work will set you free - the same ironic words are on the gate at Auschwitz. 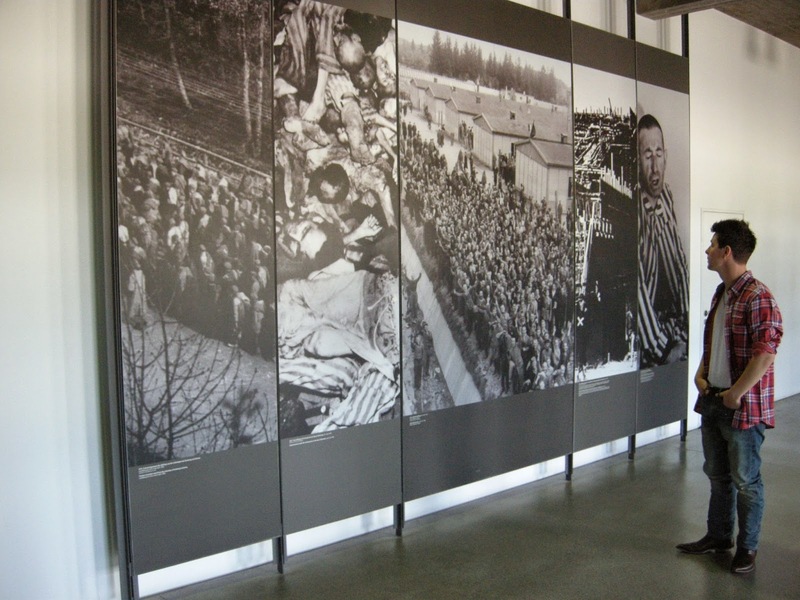 Dachau was not an extermination camp, although eventually people were killed there. 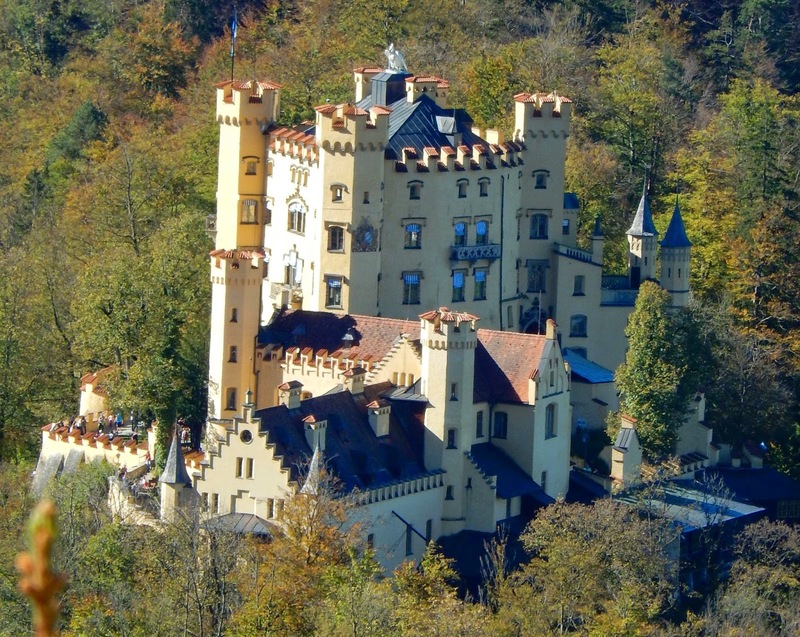 Originally, it was a place where Hitler sent those who opposed his regime, enemies of the state. Over time, it also housed homosexuals, the mentally ill, common criminals and, of course, Jews. Life for the prisoners was extremely difficult; it seems as if the goal was to break them through hard labour. It took the Germans 10 years to decide how they would turn this site into a museum to honour those who were held there and the many who died, especially in the final years of the war when a Typhus epidemic caused the number of deaths to double. 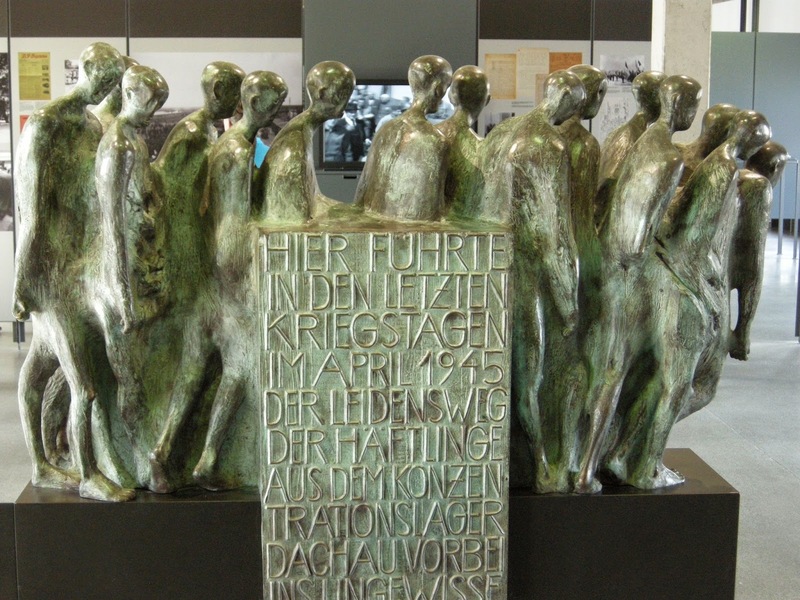 To their credit, the Germans wanted to get it right, to atone for the crimes against humanity in Hitler's time. 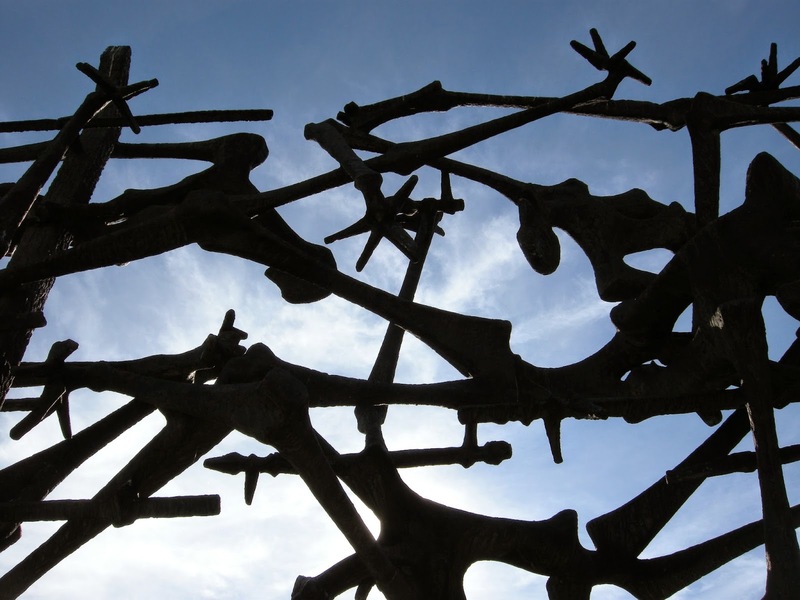 Detail of a moving sculpture at Dachau. The shapes depict men and barbed wire. I thought the art was especially powerful and have included several photos of pieces that caught our eye. They speak for themselves, I believe. The unknown prisoner: "to honour the dead, to warn the living". 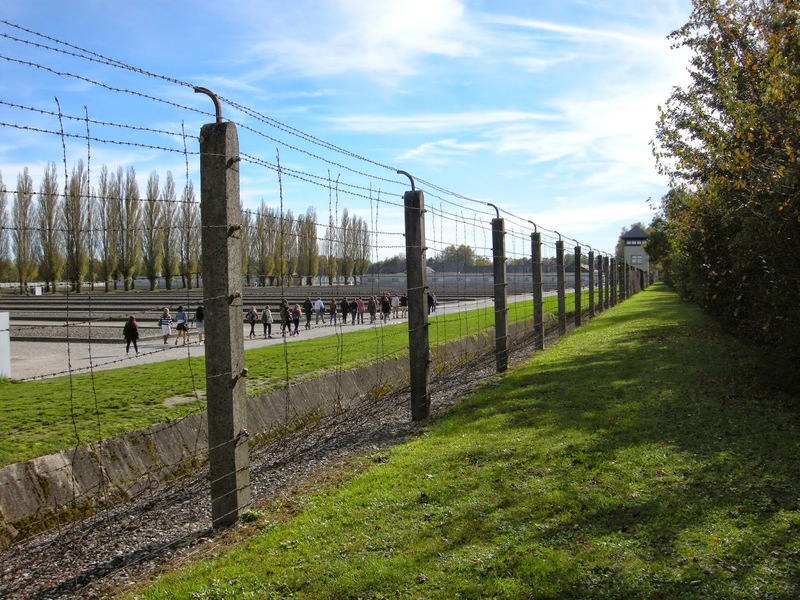 It was sobering to walk the grounds of Dachau, but it was important to do so. We learned a great deal from Robert. His impassioned message to us over and over again was that the men who ran these camps were evil and that the Germans who lived nearby knew what was going on. Dachau stands as a warning that never again should this sort of oppression occur. After a stop for lunch, we made our way back to Munich for the rest of the day. The students were left to explore on their own and Bob and I did the same. The day was quite lovely, and we took advantage of the sunshine to photograph some of the city's most famous landmarks. 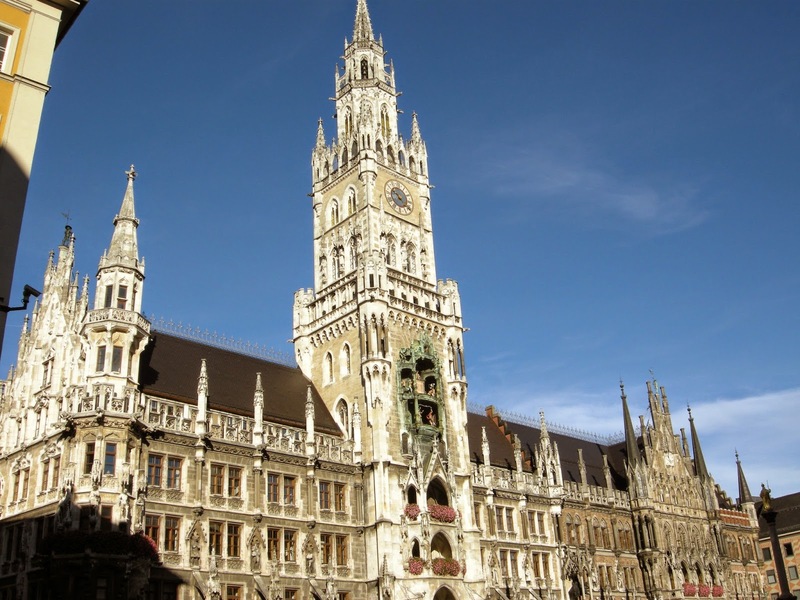 Nothing is more so than the neo-gothic Rathaus, which miraculously escaped bombing. That evening, we all ate beneath this building in the Ratskeller, another massive place serving traditional Bavarian food. On Sunday morning, we left Munich on the road to Switzerland. We took a different route this time, so that we could make two stops along the way. 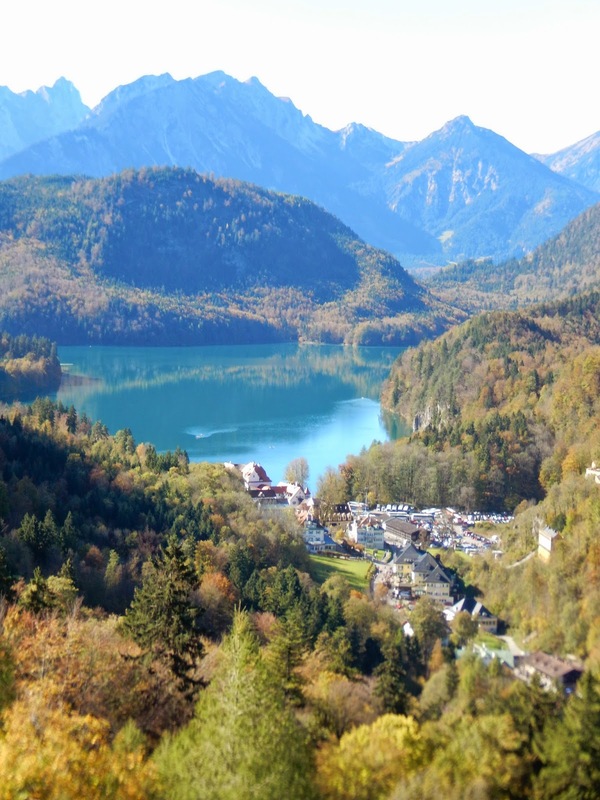 First we went to Neuschwanstein Castle perched high above Hohenschwaugau village and looking towards Hohenschwangau Castle, the summer home of King Maximillian II of Bavaria. 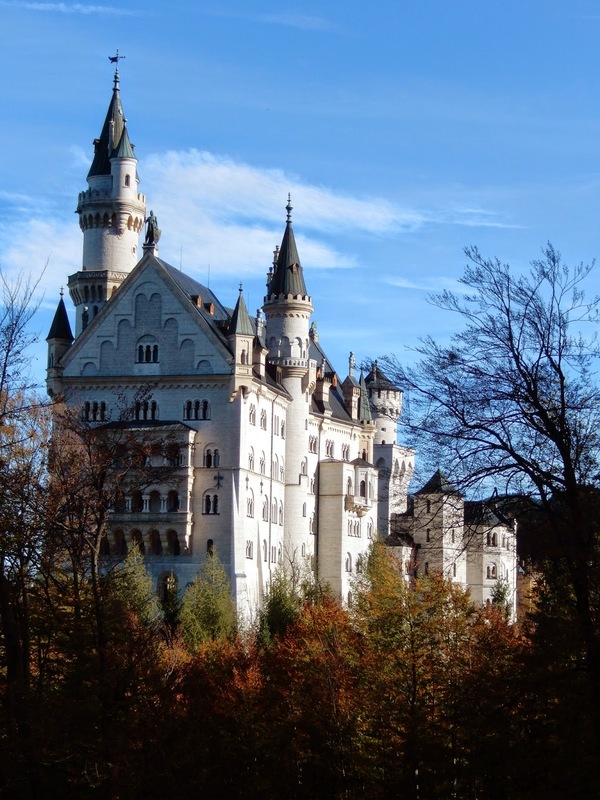 Commissioned by his son, Ludwig II of Bavaria, Neuschwanstein Castle was the inspiration for Walt Disney when he imagined where Sleeping Beauty would live. It is very sumptuous, although it was never finished. 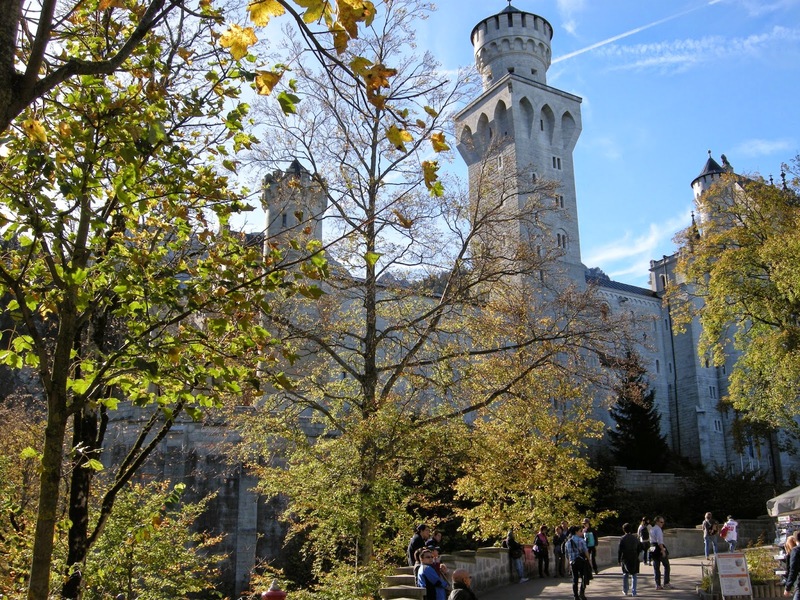 Ludwig II died under mysterious circumstances and shortly afterwards, the castle became a tourist attraction. The views from this area were truly spectacular, and we had ideal weather too, so for that reason alone, it was well worth a visit. Our final stop was some twenty minutes away. 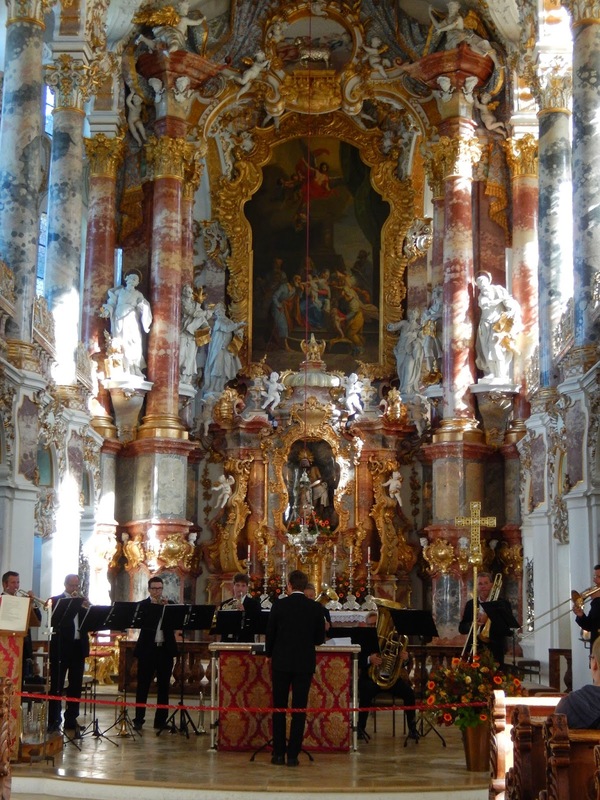 Wieskirche, a fine example of Baroque architecture, is quite plain on the outside but spectacular on the inside. To add to its beauty, on this day, we were treated to a mini concert by a brass ensemble who were rehearsing for a performance later than day. Serendipity! It was about 3:00 in the afternoon, when we boarded the bus and headed for Neuchâtel. This had been quite a trip, but we were glad to return home.